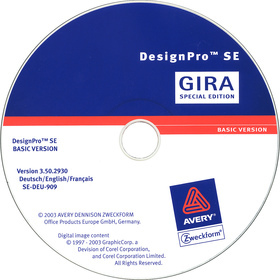 Software for inscribing the Gira DIN A4 inscription sheets. Professional software solution from Avery Zweckform. With DesignPro designing and printing labels and cards is child&apos;s play. Over 500 Avery Zweckform labels and cards are available as templates. Simply select the desired template, design it as desired, and print it in the quantity required. Multi-layout function, i.e. each label can be designed freely. Drawing tools for lines, rectangles, circles, and polygons. Graphic import function (e.g. BMP, WMF, TIF, JPG, PCD, PCX, EPS, etc.). Counter function (numeric or alphabetical). File import via ODBC (e.g. from Access®, Excel®, dBase®, text, etc.) incl. filter and sorting function. Creation of user&apos;s own databases in dBase® format. Automatic read-in of data carrier directories for backups. Grids, help lines, and rulers for exact alignment. System requirement: Microsoft® Windows® from XP.